The motorcycle world is full of oddities, but this is one of the strangest we’ve ever seen. 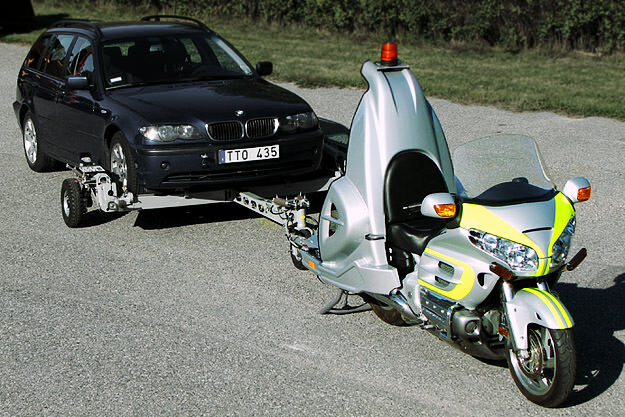 It’s a Honda GL 1800 Gold Wing that’s been turned into a tow vehicle by the Swedish company Coming Through. The Retriever is fitted with a towing assembly that weighs only 165 kg, but it can haul up to 2.5 tonnes at a maximum speed of 30 kph (19 mph). Why a motorcycle rather than a truck? Because a motorcycle can weave through the traffic on jammed highways. Ingenious.